It is well-documented that swimming is one of, if not the best, form of exercise we can undertake – giving our bodies a thorough and invigorating workout. Less well-known are the benefits it can have for people suffering with dementia. Dementia affects around 850,000 people in the UK, and the grim reality is that dementia is now the leading cause of death in England and Wales, as well as the leading cause of death among British women. It is not a natural part of the ageing process but many of our lives have been blighted by the distressing nature of dementia-related conditions. Dementia is not a disease in its own right, rather an umbrella term for a group of symptoms caused by the numerous diseases that affect the brain, such as Alzheimer’s, Huntington’s disease, Parkinson’s disease, Creutzfeldt-Jakob disease or a series of strokes. Swimming, under supervision, is an excellent activity for people with dementia. Many sufferers have reported the sensation of simply being in the water as soothing and calming, while several studies have demonstrated that swimming can improve balance, and thus reducing the risk of falls in older people with dementia. Which brings us to the Amateur Swimming Association’s (ASA) Dementia-friendly Swimming Project – a genuine ray of light for those enduring the darkness of dementia. Last year ASA coordinators worked alongside local authorities and leisure centres in the cities of Durham and Manchester, where pilot schemes were rolled out, to create dementia-friendly swimming sessions. The sessions were designed to help boost sufferers’ physical, social and psychological well-being. The project has been an unbridled success, and as such has been rolled out to a further half dozen new locations across the country (Bristol, Nottingham, Barking & Dagenham, Crawley, Tower Hamlets and Hackney) – with a glut of other councils also registering interest and now holding sessions. Dementia is one of the biggest health challenges facing the country today, and the growing popularity of the scheme can play a vital role in the care of sufferers and the challenge of controlling and managing the debilitating symptoms. The project aims to have more than 100 pools across the country by 2017 offering dementia-friendly sessions – with the focus on enhancing both the swimming experience and, more importantly, the quality of life of those living with dementia. A one day workshop has been developed alongside the Alzheimer’s Society for pools and leisure centres to tailor facilities and give staff a greater level of dementia awareness. KUDOS is keen to encourage anyone with family or friends affected by dementia to get involved with the Dementia-Friendly Swimming Project. Visit their website to find out about projects near to you, or simply Google ‘dementia friendly swimming’. You’ll be surprised how many options there are. Dementia-friendly swimming sessions are overseen by specialist teachers, with many of them holding social gatherings afterwards in the café for “a brew and a natter”. These seemingly small gestures can provide significant benefits. We would also encourage carers to consider swimming as a valuable and worthwhile activity if there are no dementia-friendly sessions near to you. Contact your local leisure centre or swimming club – simply getting in the pool for 30 minutes or an hour can provide a genuinely worthwhile boost to sufferers’ physical, social and emotional well-being. 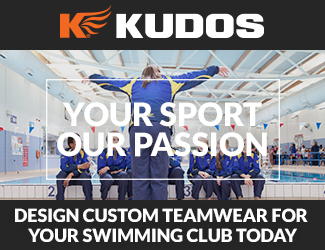 KUDOS passionately supports and encourages people from all walks of life and backgrounds to get into swimming at any level.